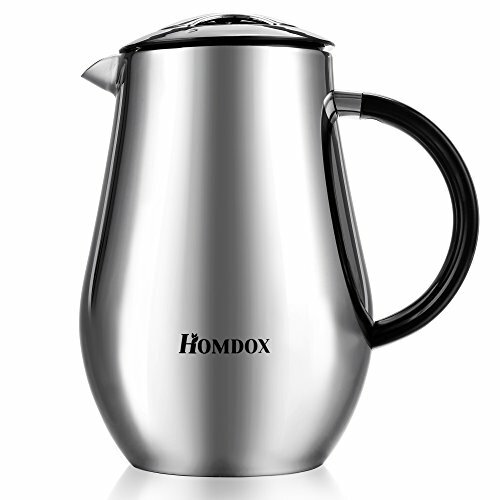 ✔ This Homdox French Press Brews 1 liter (8 coffee cups, 34oz.) of the best rich tasting coffee. Carafe is made of durable, heat-resistant borosilicate glass up to 130℃/266℉. All parts are BPA free. ✔ Made of ABS plastic and many layers of chrome this handcrafted coffee maker is in its own borosilicate glass with the stainless steel clip and filter, all are manufactured to high quality standards for long lasting life. ✔ With flowing line, auspicious sign, decent and classical design, the result is a modern classic, sure to another 20 years of changing design trends and fashions. ✔ The French Press can be used as a Coffee or Tea Press Pot and is the best way to prepare coffee, tea, iced tea, frothed milk, hot chocolate, fruit infusions, almond milk, cashew milk, plant tinctures, lemonades, rinse quinoa and more. ✔ Lifetime Guarantee - Buy with absolute confidence thanks to our 100% money back lifetime guarantee.